A rock. Its extremity points the ether and its thicker base merges into the stony ground. The giant stone opens its gaping mouth. Cloudy sky light emphasizes the reliefs of its armour. Is it a shadow or a cavity ? Blackness has the depth of an abysmal obscurity. The rock in cloudy weather, drew by Thomas Barbey with Indian ink, reveals many faces. Anthropomorphically, it evokes a round-shouldered figure shattered by the sea winds. Would it be Cambremer’s 1 sanctuary ? In order to expiate his son’s death, this character decided to expose himself to the ocean till he merged into the rock which sheltered him. Or, in the Romantic ideal, woud it be a silent figure contemplating the horizon ? The atmospheric perspective effect makes the sea disappear in the background. Thomas Barbey pictorially does not accentuate the sea which vanishes into the horizon. 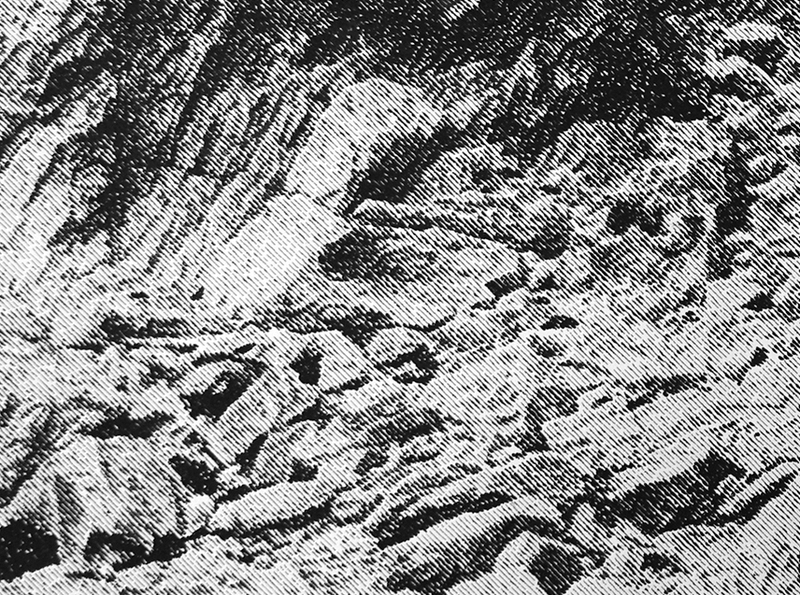 The landscape covered by boulders could be terrestrial or lunar as it is similar to lunar mare, basaltic plains on the surface on the moon. Paradoxically, the seaside rocks, apparently deserted, hold perennial plants. 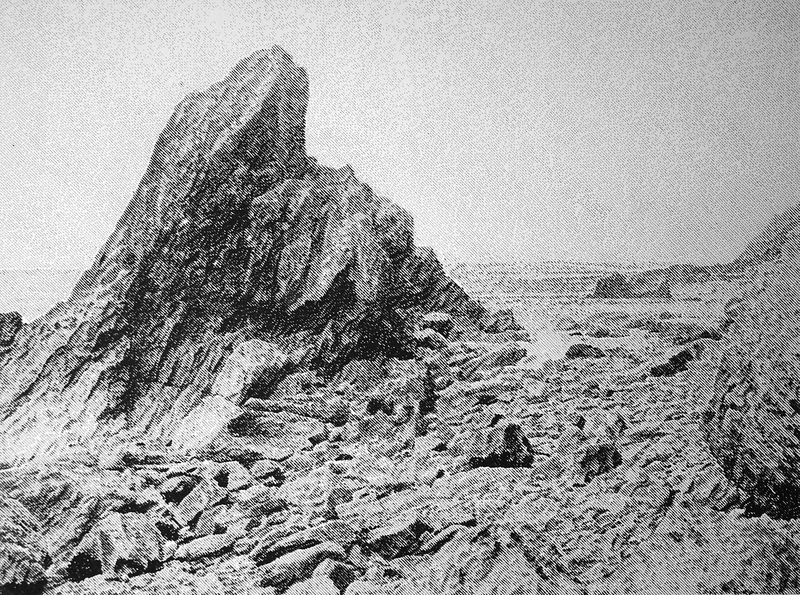 In the manner of Monet in his painting Les rochers de Belle-Île, la côte sauvage, Thomas Barbey focuses on the texture of this heaping up of dreadful rocks 2, covered by lumps. He celebrates the suggestive and poetic powers of their shadows, where a theater of mysteries takes places. The eye draws shapes and creates new images. At the heart of the mysterious fragments come alive grotesques, escaped from boulders. The unmovable rock travels through the ages. Past could be read in its irregular projections. Thomas Barbey rightfully evokes the immutability of this quiet figure. The rock is surrounded by Heraclitan elements. It borders the sea which, from a wave, rises over and over. The stone will never move. If he reproduces the machine movement, Thomas Barbey’s composition observes the proportional value of each detail into an ensemble. 4 The imagination gives a spiritual dimension to the physical reality.5 The visible tranquillity of eroded stones conceals a locus terribilis potential. Thomas Barbey is liberated from these images, and he liberates us as well. 1. DE BALZAC, Honoré, Un drame au bord de la mer, (published in 1834 in Le Voleur), Publisher : Werdet, in Etudes philosophiques, 1843. 2. Letter from Claude Monet to Gustave Caillebotte, Kervilahouen, October 11th 1886. 3. Thomas Barbey’s text from L’eau et les rêves, Gaston Bachelard. 4. BAUDELAIRE, Charles, Salon de 1859, Chapitre VII « Paysage », in Œuvres complètes de Charles Baudelaire. II, Curiosités esthétiques, Paris : Michel Lévy Frères, 1868. 5. Revue d’histoire littéraire de la France, LABARTHE, Patrick, Locus amoenus, locus terribilis dans l’œuvre de Baudelaire, PUF, September - October 1999, Number 5. 6. BACHELARD, Gaston, L’air et les songes, essai sur l’imagination du mouvement, Paris : Librairie José Corti, 1943.